Pregnancy Craving? Time for Salmon on the Grill! I didn't plan on joining this month's challenge. I've never cooked any seafood on the kamado, as I'm always paranoid about under cooking and getting someone sick, especially now that my wife is six months along. But she loves seafood and really wanted me to make a recipe she found, so here we go. Step one: Halve and peel peaches, then soak in lemon water. Step two: Make the corn and bacon relish. Cut the bacon small, cook until fairly crisp, then pour off most of the oil. Add in (frozen) corn until warmed, then add a splash of cider vinegar. Salt and pepper to taste, then keep warm until time to plate. Step three: Prepare the asparagus. Toss in olive oil, then add rub. Foil up and grill around 350°. Step four: Make the fish rub. In relative amounts, use one portion of cinnamon, two of cumin, and four of paprika. Salt and pepper to taste. Apply to the rub to the filets, then lightly rub with olive oil. Drizzle honey on top, then move the filets (on a cedar plank) to the grill. Cook until done (minute were twenty minutes). Step five: Once the fish is on the grill, also add the peach halves. Grill about ten minutes on each side. Plating: Top the salmon with some lemon butter (lemon zest with 4 tbsp melted butter). Drizzle honey over peaches. Final step: ENJOY! This actually turned out really well. I was suspicious of the cinnamon in the fish rub, but it came through very nicely. And though I know this already, I really need to grill fresh fruit more often. Such a nice way to end a meal. The meal took two days to bring together. The prep, in roughly chronological order, follows. Exact recipes will be in follow up posts to keep the length of this one down. Mixed together some flour, water, and yeast to make a biga. Let that sit for nine hours. Afterward, mix in more water, flour, sugar, salt, oil, and milk. Knead (hopefully with a machine of some kind) then let rise for an hour. Most recipes call for loaves, but I like rolls. However, I can never seem to shape and size them right. Let's just call them extra rustic. Let the rolls rise for another half hour, then bake around 450°F. Preferably not in a thunderstorm like I did. Twenty minutes had them fully cooked with a nice brown bottom crust. I don't think the conventional oven could have done better. A Mary Berry recipe. Many lemons, even more eggs. This was all done while letting the biga form. The dough was brought together in a food processor. Then I (badly) turned it out into my dish. As always, don't forget to blind bake! Next, the lemons were juiced. Finally, all the filling ingredients were mixed together until smooth, then poured into the fully cooled shell. Bake for the listed 40 minutes, then another 10 to not end up with soup. And yes, I did switch my oven over to Celsius for this part! Bought six pre-trimmed short ribs that came to three pounds total. Made a garlic tomato glaze using some marinara sauce I made from scratch two days ago. Coated the ribs in salt, then the garlic sauce, then a whole bunch of pepper. Added about two cups of a chianti and some herbs, then moved to the grill with the hope of a moderate simmer. After an hour and a half added some more wine and covered the dish to start the braising. I didn't rotate as often as I should have, but they became plenty tender and the bones pulled out cleanly. After about four hours total, I removed the meat and left the sauce uncovered to reduce. Took three of the more misshapen ciabatta rolls and sliced in half, brushing some olive oil on each side. These were then toasted on the grill. The misses chopped up some of her homegrown tomatoes, then combined with pieces of the toasted rolls, along with some olive oil, balsamic, salt, pepper, and fresh basil and oregano. Green and yellow squash (yellow homegrown) were sliced, then tossed with olive oil and fresh basil and oregano. Place into a foil bag, and roast. While waiting, a mix of heavy cream, goat cheese, and a splash a milk was heated along with a good stalk of basil. Once the squash was done on the grill, toss it in the sauce. And that is how we ended up with tonight's meal, where my father-in-law joined us to celebrate the upcoming birth (December is upcoming, right? ) of our first child. - Good quality microwavable veggies are a godsend. -If a period piece ever shows a cook not working, it's a lie. - Lemon pie for breakfast is awesome. Ok, I already knew that one. Wings rings and red pepper mozzarella bomb thang! 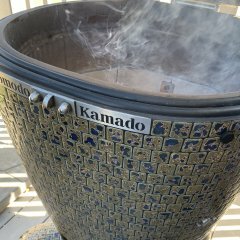 Okay, @KismetKamado I've heard you loud and clear. So I was attempting wings, rings and mozzarella sticks. However disaster struck when I was trying to put them on the grill. Oh well, made adjustments on the fly and it turned out nicely to say the least. Started with the wings; marrinated for a few hours in about a quarter cup pure NH maple syrup, quarter cup Gansett, salt and pepper, garlic flakes, cilantro and a pinch of turmeric. In the fridge they went. Then I cut up my onion rings, mushrooms, and opened the mozzarella cheese. Dredged through egg wash, flour and a homemade pretzel bread crumbs coating. (salted pretzels, black pepper, garlic, onion and cilantro. Ran food processor on chop then purree.) Set up grill for indirect cooking at 350. Took wings out of marrinade and coated with famous Dave's spicy hot chicken rub. Wings go on the grill. Go to get my cheese sticks and veggies. Got 1 mushroom, 3 onion rings and 3 cheese sticks on to doubled over lightly oiled hd aluminum foil. The rest went all over my porch. Then the mozzarella turned into a melted glob of cheese. So I went inside and cored out a red pepper to stuff the cheese into. It went directly onto the coals as I was looking for a nice char on it. Sauce was applied to wings last 30 minutes and turned with a reapplication of sauce. Suace: 1 bottle Anchor Bar medium wing sauce, quarter stick butter, black pepper, garlic, cilantro and a pinch of chipotle. Cooked for almost 2 hours at 350° until no pink when peeled from bone and internal temp of 165. Did it over 2 small chunks of pecan. Nice crisp skin and fall off the bone wings. Everything was very good, my wife and I both really enjoyed the red pepper bomb! It was a ton of fun. 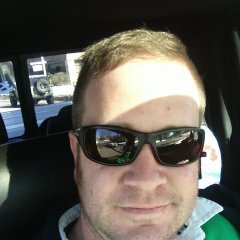 Alright - so I mentioned I was thinking of doing an Indonesian flair with my taco challenge cook. And then, after accusing me of being a slacker last night, @ckreef made a comment about driveway tacos. Well, I figured, why not.... Weather was supposed to be iffy and driveway tacos sounded good. My only concern was driveway tacos turning into street tacos if my grill got away from me on the angle, but all worked out ok.
Not pictured were some brown sugar, fresh garlic (I only had a clove) and some rice wine vinegar. Seems like there were a couple other things too (water, avocado oil and probably other stuff too)... did I mention it was late??? Cut up some filet, a strip and chicken. No picture of the chicken because pretty much once I have raw poultry out and about I touch as little as possible... lol. 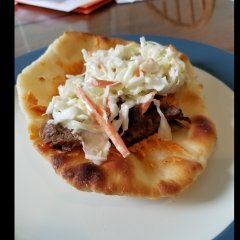 So today I get after making my shells and slaw to go with my satay tacos. First up, I get the shells on. I spritzed the egg roll wrappers with oil and then put them on the grill on my new taco rack / iPod holder. Then I put together the slaw. And onto the grill with the meat. Beef up first and then chicken. I had cut the pieces small, so I did them in a cast iron pan (my favorite handle lopped off with a chop saw one). Then brought the meat in and chopped it up a bit more. And assembled tacos - plated with a little sriacha and lime. Getting this one in just under the wire.... but glad I got it knocked out. Decided to do a tequila lime chicken to round out the $3 challenge cook. I have been intrigued by Mexican Street corn for awhile. Indulged and scratched that itch for the this cook. I got cheap chicken at the store (and cheap tequila) ... lol. Wasn’t expecting chunks, but that is what I got.... marinated the chicken in citrus juice, cheap tequila, jalapeño, garlic and rub overnight, Soaked beans overnight. Cooked the beans on the Akorn jr for a couple hours and then added to rice I made in the instant pot. Street corn turned out awesome. Chicken was really good. Would have preferred full breasts... but you take what you can get when cooking on a budget. Just barely under $3 a plate. Corn was spendy this time of year. Lol. Could have gone with way less on the rice and beans... but it was good!